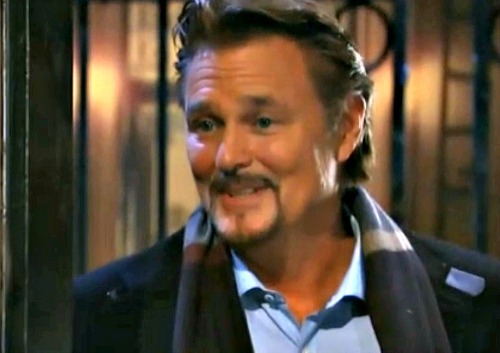 General Hospital (GH) spoilers reveal that Jim Harvey (Greg Evigan) has become a key player in recent days, especially when it comes to Ned Quartermaine (Wally Kurth) and his plans to become Mayor or Port Charles. Ned swore he would run a clean election, and alongside longtime friend and land developer, Jim Harvey he promised to keep Port Charles’ historical values and make it better. But can he do that, when Harvey’s history with his nephews, Drew Cain (Billy Miller) and Franco Baldwin (Roger Howarth) comes to light? General Hospital sources tease that it never made sense for Betsy to send Drew away if Franco was the one who was hurting Drew. As a parent, back in those days, if one child was being so aggressive and abusive to the other, it would be the abuser who would be sent away for treatment, not the abused. BUT it would make sense that she sent Drew away, and faked his death if she was terrified of her boyfriend, who was abusive. Could Jim Harvey be the one who did something to Drew, and Franco witnessed it – something so traumatic, he still blocks it out today? Even worse – did Jim harm Drew and blame Franco for it? General Hospital spoilers reveal now that Jim knows Drew is a Quartermaine and alive – what does this mean for his friendship and business in Port Charles? Jim has shown that he is not afraid of anything nor anyone. However, anyone who really knows what Drew has become would have great reason to fear Drew’s wrath. Rotten food delivered to Charlie’s Pub, owned by former mobster Julian Jerome (William deVry). Gas leaks in low-rent buildings where the Police Commissioner’s son lives. Jim will stoop to some pretty low levels, and so far Ned has let that slip by – but how will Ned react to his “partner in crime” being abusive to his nephew as a child. Will Ned stand by his blood, or will his craving for control and power outweigh his loyalty to the Quartermaine name? It’s only a matter of time until Drew Cain runs into Jim Harvey, will Drew have any memories of what happened to him – will Jim Harvey be the key that sparks Drew’s recall of his past – will Jim be in a world of danger and trouble if he harmed Drew? Be sure to tune into ABC’s General Hospital (GH) to catch up on everything happening in Port Charles right now. Check CDL General Hospital spoilers often for updates, news, and spoilers!